Lou Solarte - "Coaching From The Inside Out"
school experience as productive as possible,". "Some schools just want to know your handicap. The more we know about our students, the better we can serve them." words, frequent winners share personality traits that other players don't. them from players who have won only once or twice, or never. - this helps them identify where their challenges lie,". "Personality traits can be managed. We've seen this with our Professional clients, our amateur clients, everyone. We all need to develop strategies and techniques that enable us to overcome our challenges, to operate like Champions on the golf course." ages, for different reasons. Personality is the only unifying aspect of this group. GolfPsych, the Mind Meter is a fully portable system that effectively monitors a person's physiology and provides real-time biofeedback on how relaxed the subject is, how clear his/her mind is. The Mind Meter produces readings on a 0-99 scale; high numbers indicate a stressed, exhilarated or otherwise busy mind, while low numbers indicate a relaxed or quiet mind. "Students wear them the entire school: all night, all weekend," . "The objective is to develop an awareness of what stress and relaxation actually feel like. From there we can develop the skills to quiet the mind as needed." improvement efforts into eight categories: goals, personality, mental skills, physical skills, wellness, conditioning, equipment and journaling. A goal is then set in each one. "Most people don't have goals that work or don't have any goals, 'Being the best golfer I can be' is not a goal. Useful goals are those that are quantifiable, something we can measure. Under mental skills, a goal might be lowering Mind Meter numbers. Under physical skills, more greens in regulation Goals need to be motivating. They need to be a little bit of stretch, too. They shouldn't be easy." The second morning session addresses the mental routine: what it is and how to achieve one. Then it's off to the range for one-on-one instruction in creating one. "We don't prescribe a one size fits all routine, but the underlying principals of a solid mental routine are extremely important,". Those routines start with "Calculation" - a left-brain activity that includes choosing the right club, your target, the shape of the shot, the yardage, etc. Calculation also includes "Commitment", which is easy if you've done a good job with calculation. The principles of "Visualization" and "Feel" move the player to the right side. These are highly interpretive principles - very right brain. "We want people to imagine they've struck the ball, to watch it move toward the target and land,". "But we also want people to 'feel' these things: the rhythm and tempo of their swings, the feel of the ball compressing on the clubface. These are all right brain activities that flush the mind of tension and crowding thoughts, and prepare us to swing athletically. They also help to block any troubling thoughts or distractions. We're in the moment. " an advanced interaction of biology and technology. Students begin by learning and practicing the art of abdominal breathing, the first step toward achieving Respiratory Sinus Arrhythmia, or RSA, the body's naturally occurring, restful, clear-minded, relaxed state. The stress and anxiety we frequently experience on the golf course interrupts RSA. The GolfPsych Stress-Reduction Method tracks and illustrates this phenomenon using two GolfPsych-developed technologies: the Mind Meter, which gives quantifiable evidence as to how close to RSA we are (low numbers) or how far away (high numbers); and the Zone Training Software which, in concert with the Mind Meter, tracks/charts this biofeedback on a computer screen in real time. "We track individual students on the big screen, so everyone can see how physiology reacts to thoughts - and how they can control those thoughts with breathing and visualization techniques,". "By this time, students have been wearing their Mind Meters for almost 24 hours. They're beginning to recognize that tension doesn't happen without thoughts preceding them, triggering them. If you don't make the effort to control thoughts, you are a passive victim and subject to whatever those thoughts might do to you. You're just along for the ride." At 3 p.m., students go outside and play golf with the GolfPsych staff. Students are still wearing their Mind Meters and numbers are gathered for every shot; each pre-shot routine and swing are videotaped. After play, it's back in the classroom for an analysis of the video and biofeedback. "We never, EVER critique the swing during these film sessions,". "We're looking at film for the mental aspects: to see how fast they swing, how they react to outcomes. Having players watch themselves is extremely useful. They have a sense for how they felt at the time, so they can observe themselves very objectively after the fact. The video and biofeedback work together: Mind Meter numbers in concert with video actually show students those moments where they're exhibiting strong, very low Mind Meter numbers - and they can't believe how smooth they look. Low Mind Meter numbers are observable, by the players themselves, in their own swings. Of course, so are high numbers." because they're so worried about outcome. changes: Mental changes. We give them homework to complete after dinner: Making a written game plan, practicing their breathing and doing imagery practice - executing good routines, playing the same holes the next morning in their minds, and imagining positive outcomes. Because we ARE going to play the same holes the next morning. "And students always do better the second day. Always." The final day of Tournament Player School begins on the tee at 8 a.m., when students gather for the GolfPsych Mental Game Open. Playing the same holes they did the night before, students compete in several categories: Best Mental Routine, Best Tempo, Lowest Mind Meter Number, Most Improved. "The class votes on the winners in each category, not the instructors,". "The improvements people make are quite striking, and everyone can see them plainly. It's important for students to hear that from other students - that clear progress has been made in the space of a single day, and that progress is clear to everyone." The final session of Level I Tournament Player School addresses the roles of nutrition and hydration. Of all the hurtful golf paradigms GolfPsych attempts to tear down during TPS, this one may be the most stubborn. "We want to help them understand the very real physical needs a person has while playing golf,". "Most people, especially juniors, have no clue what eating healthy really is, what proteins, carbs and fats are. But that's just part of it. They don't understand how many calories they need to play effectively. You burn 2000 calories walking and carrying your bag during 18 holes... They don't understand the relationship between electrolytes and hydration - that nutrient loading and hydration should start the night before a round. "These factors,", "have a huge impact on your ability to play; they can pay big dividends. People need to understand that Coke and hot dog at the turn are going to make it harder to play the next four to nine holes. These are new ideas to most people and they can have a big impact, especially on juniors. Parents tell me afterwards that our nutrition talks have given their kids a reason to pay attention to what they eat - because it's going to be good for their golf." At noon, GolfPsych graduates its Level I class and sends them out into the world, but the relationship doesn't end there. Students are supported by the tools they received during Tournament Player School - the Program Planner, the GolfPsych Report, the mental-game foundations they've built - plus additional tools like the Mind Meter, monthly e-mail and individual Mental Game training at Cantigny. 7:00PM 1 hour GolfPsych Demonstration For Your Members. 7:00PM Opening Remarks, Review Profiles & 8 Traits. 9:00AM Goal Setting, Mental Routines . 10:30 Range & Putting Green with Tension Meters. 1:00PM Thought Control, Tension Management. 3:00 On Course Application With Tension Meters. 8:00AM On Course "GolfPsych Mental Game Open"
12:00 Hydration and Nutrition for Golf. The 50-page GolfPsych Report is based on your personality. If you study this report and follow these recommendations, you should be able to significantly improve your mental game and therefore your scores. This is true whatever your physical skills. Personality Assessment and GolfPsych Report are the first two steps we require of any new client. Our studies found that 8 Personality Traits distinguish the Tour Champions from the other professionals. All golfers in these studies were members of the PGA Tour, Senior PGA Tour or LPGA. The Tour Champions group was selected based on their record of wins vs. years on Tour and Majors. The near-Champion group had won, but only once or twice. The non-Champion group had never won. Compare your personality to the Tour Champions and begin developing your Tour Quality Mental Game today! After you order, we will send you instructions by email to access the online personality assessment on a secure server. Your answers will be sent to us for evaluation and generation of your personal GolfPsych Report. Your scores and personal information will be kept confidential. We will not share your information with anyone without you permission. This zippered three ring binder contains 8 sections: Goals, Personality, Mental Skills, Physical Skills, Wellness, Conditioning, Equipment and Journaling. It includes tools for Goal Setting and Journaling in those sections. The other sections include discussion of the steps you may take to work in and strengthen those areas. Your GolfPsych Instructor can help you fill in these sections with modules and exercises to maximize your whole game and life. Helps you organize your efforts and manage your progress. When you take the Personality Assessment, the results and recommendations can go into the Personality section. The results and recommendations from the Mental Game Analysis would be organized into the Mental Skills section with any retests to show progress. After you meet with your swing coach, notes on their recommendations and instruction can be kept in the Physical Skills section along with your practice plans and results of skills testing. Suggestions for effective practice are included in this section. The Wellness Section is for efforts in nutrition, hydration and maximum wellness. This can include the results from our Wellness Assessment based on your blood analysis with recommendations on changes to diet and supplemention. Conditioning will collect your plans for increasing flexibility, strength and stamina. 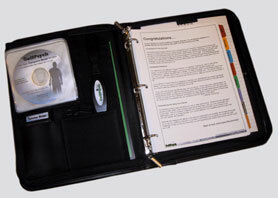 The quality zipper binder will stand up to abuse and keep your program safe. It also has pockets for your GolfPsych Instructional Videos and Tension Meter. Keep everything in one place. Track your mental performance on the course. Each page of the scorecard has room for notes on 18 holes and 7 shots per hole( of course you won't need that many shots, but just in case). It also has spaces for your mental goals for the round and cues for using our "4 Questions" technique after any shot that your play poorly. Like having a coach in your pocket. This will help you stay focussed on the mental side while playing. Ten pages per book. On the back of each tear out sheet is a short post round rating form. This should be completed some time after the completion of the round. This tool will help you gain insight into your mental errors and quantify how you are doing. This will then lead to adjustments to your mental goals and better performance the next round. You will learn more from your worst rounds than from your best if you evaluate your performance after the round. After all you don't want to continue making the same mistakes. This tool will also give your GolfPsych Instructor good insights into what is happening during the round. The Mind Meter, an RSA monitor, measures how busy or quiet your mind is. Your level of mental activity is displayed as a number between 00 and 99. Learning to quiet your mind to play any golf shot or putt is critical to good performance. Most players are thinking about the wrong things, anxious or working hard with the left side of their brains to play a shot. Operating in this way makes it much harder to play good golf shots and putts consistently. Through our research with players on the golf course we have found that everyone has an optimum level of mental activity for full shots and a lower level of mental activity enhances short game skills and putting. The Mind Meter enables you to quantify these levels and learn what they feel like. It gives you the ability to practice playing at the optimum level of mental activity for the type of shot you are executing. It will raise your awareness of the subtle changes in your level of mental activity. It will help you learn to manage your thoughts and level of tension to play your best golf! 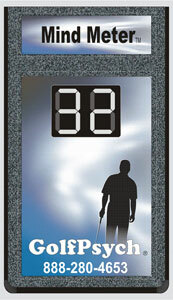 The ability to measure your level of mental activity on the golf course has never been possible before. The player that learns to manage their mental game based on the shot they are playing will play better and play in The Zone more often. Consistency will improve and you will play to your true potential. "The Eigth Traits of Champion Golfers"
"To play any golf shot correctly requires an unwavering concentration. The most perfect swing in the world needs direction, and plenty of it, and when its possessor begins to do a little mental daisy picking, something always goes wrong." Every golfer spends countless hours working on the technical aspects of his or her game. Checking one's grip, adjusting one's stance, tinkering with one's swing technique -- these are all activities that have ceaselessly been drilled into a golfer's routine. What many instructional books -- and many professional teachers -- fail to address is the most important tool a golfer can bring with him or her to the course: A strong mental game. In The 8 Traits of Champion Golfers, Dr. Deborah Graham and Jon Stabler explore the eight fundamental areas that make up a strong mental approach to the game and explain why these are the mental areas in which every champion golfer excels. Using their copyrighted GolfPsych program, Graham and Stabler present a revolutionary approach to golf. By identifying the eight individual personality traits that are essential to a strong golf game, the authors have illuminated the critical qualities that separate true champions from the equally talented run-of-the-mill professional golfers on tour. The unique ongoing demands of high-pressure tournament golf cast a harsh magnifying light on the psyches of those who thrive in that arena. By studying these golfers, and isolating their strengths, Graham and Stabler point the way to a better approach for all golfers regardless of their level of skill. Through a series of questions and techniques, the GolfPsych method challenges readers to explore the crucial elements of their personalities so that they can compare themselves to and emulate the greats of the game: Lee Janzen, Dave Stockton, and Michelle McGann, who are all GolfPsych clients and all champions. The 8 Traits of Champion Golfers is a unique approach to the teaching of golf. Graham and Stabler have given us the first true golf self-help book based in solid research and delivered in a helpful, reassuring fashion. Much like Harvey Penick's Little Red Book and Steven Covey's The 7 Habits of Highly Effective People, The 8 Traits of Champion Golfers provides an unparalleled look into the human psyche and presents ways in which any person can improve his or her self through time-tested methods. By presenting this unique way to improve one's golf game, Graham and Stabler have also presented a great way to improve the quality of one's life.